Conundrum Press is very excited to announce it has bought the English rights to Croatian artist Igor Hofbauer’s graphic novel Mister Morgen. The French edition is being published by L’Association in April 2016. Look for this English version for Spring 2017. Translation from the Croatian and introduction by multiple Doug Wright Award winner Nina Bunjevac, artist of Fatherland and Heartless. Mister Morgen will be the latest release in the Conundrum International Imprint. Igor Hofbauer is a Croatian illustrator and a comics author whose name and unique visual expression is mainly connected to the famous Zagreb club Močvara for which he has been designing posters and programs since the club’s inception. 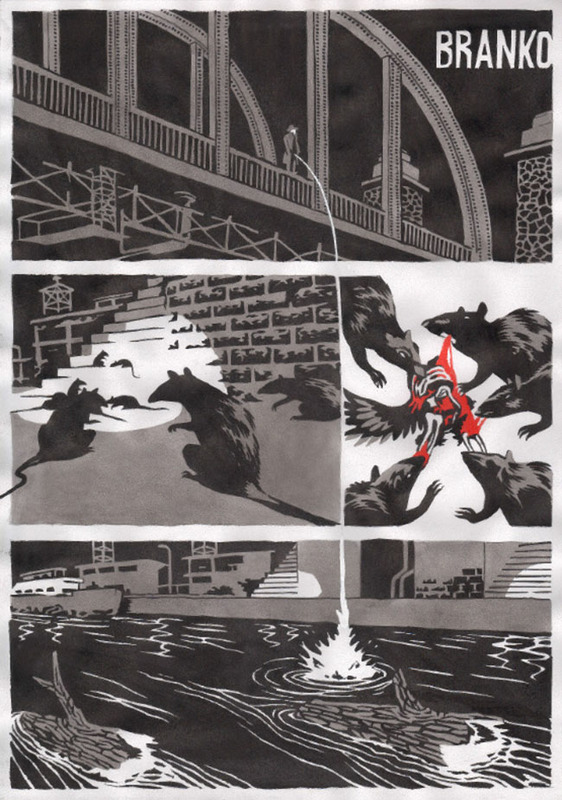 The style of his comics is instantly recognizable, based on a combination of classic American underground comics and film noir, pop art, German Expressionism, and Russian Constructivism. Hofbauer’s comics are often surreal and nightmarish stories in strange cityscapes that will be recognized by anyone who has spent time in the concrete housing and brutishly planned neighbourhoods of the former Eastern Bloc. As a comics author, he was first published in the collective publication Komikaze, and then, most recently, published Prison Stories in Croatia by Otompotom, in Portugal by the MMMNNNRRRG editions, and in Belgrade by Fabrika Knjiga (edition Studiostrip). In 2004 his posters were published in The Art of Modern Rock: The Poster Explosion, a luxury compilation of recent world rock posters, which includes the most important works of over 350 international artists.